Barber Shop Aid® Bump Remover™ Spray 2 oz. "Your first aid for healthy hair & scalp"
Barber Shop Aid® Bump Remover Spray 2 oz. 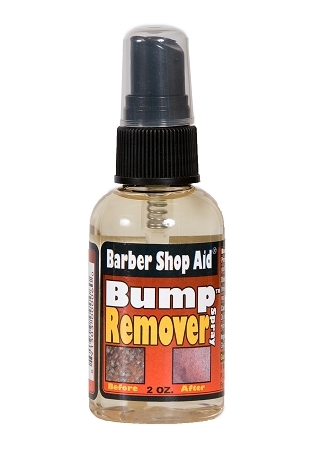 Barber Shop Aid® Bump Remover™ Spray is your first aid for razor bump relief treatment. It stops the itch, irritations and help to remove razor bumps quickly! Keep a bottle of Bump Remover Spray on hand with you on your job. When ever you feel the itch or irritation just spray on and rub in that area. For bikini are moisten a Q-tip with Bump Remover and apply directly to razor bump. Just Spray razor bumps (ingrown hairs) 3 times a day until bumps vanish. Guaranteed results in as little as 2 hours! Barber Shop Aid® Alopecia Mist™ Leave in Conditioner Mist Spray 8 oz. Copyright Barber Shop Aid® Brand Products. All Rights Reserved. eCommerce Software by 3dcart.